One of the most challenging courses in Myrtle Beach is the beautiful Myrtle Beach National West Course. From the regular tees, golfers of all abilities will enjoy this classic Arnold Palmer design. Golfers should come prepared for a professional and unique challenge from the back tees. Numerous doglegs, fairway bunkers and natural hazards come into play throughout the round. The West course, was carved through a majestic pine forest indicative of golf courses in South Carolina, The West offers everyone the feel of a private club. 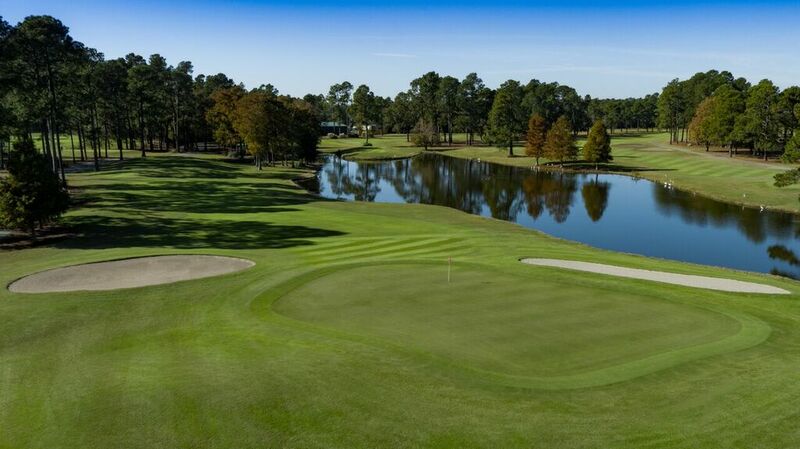 Located in central Myrtle Beach, the West Course can be found onsite of a 3 course complex. The sister courses (Kings North and South Creek) make up this impressive complex. This allows guests to play 3 courses out of one central location. Therefore getting in more than 18 holes in one day is a very easy task. Some of the best holes on the course include the par 5 tenth hole, a straight shot away from the clubhouse. Long hitters can reach the green in two shots, while three well-placed shots will leave a short approach and good chance for birdie. The par 4 fifteenth hole features water down the left side, but is manageable at only 387 from the members tee. The closing 18th hole, is the rate par 3 finish. Water on the left, and sizable distance (221 yards from the tips) both provide a worthy challenge to the completion of a round. The Myrtle Beach National West Course is a great course for the first day of a golf trip. Additionally there are many package options available for booking. With its location, the course can be combined with its sister courses as well as the other great Founders Group offerings.